The economy and education were big topics at a recent Taber-Warner all candidates forum in Coaldale. Hosted by the Coaldale and District Chamber of Commerce, Taber-Warner candidates Jason Beekman (Alberta Party), Grant Hunter (United Conservative Party), Laura Ross-Giroux (NDP) and Amy Yates (Alberta Liberal Party) answered questions concerning topics such as agriculture, the price of oil, GSAs, taxes and the environment to a packed room at the Coaldale Community Centre on Wednesday, April 10. Candidates fielded questions generated by both chamber members — which were available for the candidates to view in advance — and the audience. 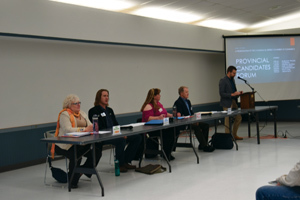 One chamber-posed question asked the candidates how they would communicate with the residents and business owners of Coaldale, and if they planned to set up a constituency office here. All four candidates said they would open a constituency office in Coaldale. One question emailed to the chamber was posed specifically for Ross-Giroux, and available for other candidates to answer, said Premier Rachel Notley has blamed the economy on low oil, but the U.S. states of Texas and the Dakotas, with similar economies to Alberta, are doing well, so how could the state of Alberta’s economy be about low oil. Ross-Giroux replied it has to do with the price differential between Alberta and American oil, and a cap on oil production that was implemented has reduced the differential from $45 to $7, which is better for Alberta oil prices. Hunter said that while Alberta did see a drop in oil in 2014, he said what Ross-Giroux “forgot to explain” is those jurisdictions had good policies in place that didn’t “drive away business”. He said the NDP increasing corporate tax by 20 per cent in a recession and implementing a royalty review caused uncertainty and led to businesses leaving the province. Yates stressed that the province can’t rely so heavily on the oil and gas industry, and they need to diversify the economy. If they had done so and grown their agriculture and manufacturing sectors sooner, “then I don’t think that the drop in the oil prices would have hit us as badly”, and there would have been jobs to fall back on. Yates said it was the result of “poor planning” from prior governments, and they needed to diversify so 60,000 people aren’t laid off or struggle to find work, as “that system just doesn’t work”. Beekman agreed with Yates that it was poor management from prior governments, but it was poor management from the past couple of governments, and not one government. He said the Alberta Party would diversify the economy, both within and outside the oil sector, to help keep the price of oil up and help people when oil is low, as “we do not need to go through another recession like we just went through”. One question emailed to the chamber was posed specifically for Hunter, and available for other candidates to answer, asked that as the UCP plan to balance the budget in the next four years, if they win the provincial election, would the party under leader Jason Kenney plan on bringing in a provincial sales tax. Hunter quickly stated “no”, and said the NDP got elected in 2015 because they didn’t tell voters they would bring in a carbon tax. Yates, whose party has proposed slashing income taxes in exchange for introducing a sales tax, said a provincial sales tax would work, and it was not going to be a “cash grab”. Beekman alluded that provincial sales tax was a “dirty word”, and while he understood what Yates was saying, “Albertans don’t need another tax stacked on them”, but rather better fiscal management. Ross-Giroux said that Brian Jean, the former Wildrose Party leader, has called the UCP’s plan to balance the budget a fiscal fairytale, as they would need to make big cuts to balance the budget, and questioned where it would come from. Ross-Giroux said that while the NDP did introduce a carbon tax, Noble Prize-winning economists have said it was the most effective way to deal with climate change. A provincial carbon tax ensures that that money stays in Alberta, whereas if the provincial one was eliminated, a federal carbon tax would kick in and that money goes to Ottawa, “and heaven knows where it’s going to go from there”. One submitted question asked the candidates how their parties protect students in GSAs. Hunter noted there has been a lot of talk in the media on GSAs, and said that in the previous PC government introduced Bill 10: An Act to Amend the Alberta Bill of Rights to Protect our Children, which mandate GSAs in any school where students wanted them, which was passed in 2015. Yates replied that the Alberta Liberals had actually introduced the first GSA bill in Alberta, Bill 202, a private members bill by MLA Laurie Blakeman, in 2014. The PCs introduced Bill 10 soon after, which at that time, unlike Bill 202 which mandated GSAs in schools when students requested them, said students could go to court if a school refused to allow the formation of a GSA. An amendment was later tabled to amend Bill 10 to instead mandate the creation of GSAs in schools if requested. Beekman said that GSAs “should not be a political topic one bit”, and it was wrong that the LGBTQ community’s right to dignity and privacy were “being tossed around like a political football”. The Alberta Party stands behind the protection for those rights for the LGBTQ community and GSAs. Ross-Giroux, who belongs to the Taber Equality Alliance, agreed with Beekman. She criticized Kenney for mentioning earlier in the week that GSA rallies and the formation of GSAs weren’t important enough to discuss at this point in the election, and while she believed UCP candidates were told not to go to the rallies, “I can say (on April 9), there was quite a few of us crossing political lines to support our kids”, and stressed the need for GSAs. A submitted question asked that with the growth of school population across Alberta, how would they would ensure suitable class sizes for learning and ensure a good student/teacher ratio. Hunter noted that the NDP has put more money into reducing class sizes, but class sizes continue to go up. Kenney has said that the UCP would create a committee to look at where the money is going, and why they can’t bring down class sizes. He added that the UCP are committed to keeping funding for education and health care at current levels, or increasing it as the need arises. Yates said the Alberta Liberals would put a cap on classroom sizes, look at hiring more teachers and increase funding for education, and they “need to have funding that follows the students” from when they start in kindergarten to when they graduate in grade 12. Beekman said they need to look at funding as the scale grows for enrolment, noting that next year there is a projected 15,000 more students entering Alberta schools. Citing student enrolment at Jennie Emery Elementary School in Coaldale, he said it is so over-crowded, that over the years it has gone from K-5 to K-4, and it will soon go to K-3, once the new high school is built, and they have to bring in mobile classrooms to house all the students. Ross-Giroux touted the NDP’s support for education, as Notley has built or modernized over 240 schools with plans to do 20 more, hired 4,000 more teachers and will add 600 more teachers and support staff each year, adding the 15,000 student increase happens every year and they need to keep up with it. She criticized the UCP’s plan to bring in standardized testing for grades 1-3, yearly competency tests for teachers and move back to the 50/50 formula from the current 70/30 for grade 12 diploma exams.